Free shipping to United States with $35 purchase from PickleDogDesign. See item details below for sale terms. 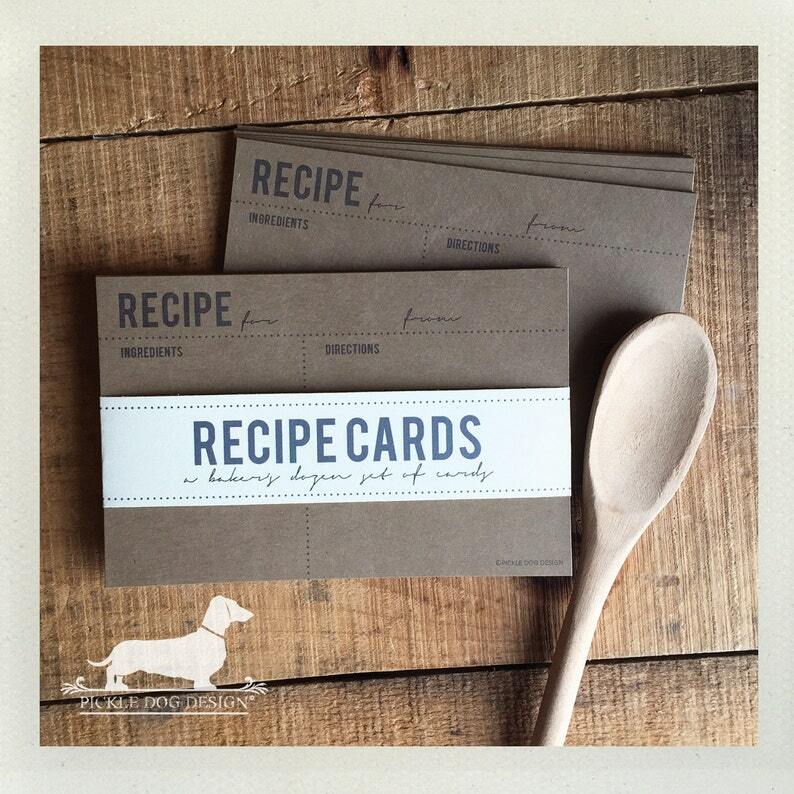 These recipe cards are perfect for any kitchen. Each card has been hand cut and printed on heavy cardstock. They make a wonderful gift for a hostess, bridal shower, birthday, housewarming party, or any other occasion! The cards are packaged in a protective cellophane sleeve, ready for gift giving. Available in 3" x 5" and 4" x 6"! Interested in custom recipe cards or a larger quantity? Contact us for details—Pickle Dog Design would love to create a special order just for you! • 3" x 5" or 4" x 6" -- Choose size upon checkout. • Ivory, White, or Brown Kraft Cardstock -- Choose color upon checkout. • Back of cards available lined or unlined -- Choose upon checkout. • Photos close to actual color, however color may vary on computer screens. Pickle Dog Design takes pride in fast shipping and tries to ship within 5 business days after payment has been received. Please make sure the address listed on your Etsy account and PayPal account is correct when placing your order. Items will be shipped to this address. Thanks for visiting! Have a wonderful day. ©Pickle Dog Design. All rights reserved. Is your purchase a gift? Add gift wrapping to your order to have your items specially wrapped in kraft paper and tied with a green bow and gift tag. Spend $35.00 and your order ships for FREE! *Order will ship via USPS First Class Mail. Expedited shipping not included or available with offer. Free shipping valid for U.S. customers only. The recipe cards are perfect! Thank you so much! Pickle Dog Design accepts PayPal (which also accepts all major credit cards). Don’t have a PayPal account and would like to pay with your credit card? No problem! You do not need a PayPal account in order to make a purchase. You can pay with a credit card, debit card, or bank account through PayPal. When you check out on Etsy, just click the PayPal button. It will take you to the PayPal home page and there you will have an option to pay with a credit card without an account. All Minnesota residents will be charged a 7.28% sales tax at checkout. Your happiness is the most important thing for Pickle Dog Design. If you are not satisfied with your purchase for any reason or it arrived damaged during shipping, please contact us before leaving feedback. Friendly customer service is our first priority and we'll do our best to solve the problem in a reasonable way. In the unusual circumstance that an item has been damaged in transit, please contact us within 3 days of receiving your item. Returns will be accepted after communicating with us within 3 days of receipt. We must receive returned item(s) within 14 days of receipt. Item(s) must be in perfect unworn condition and in the gift box provided, packaged in a bubble mailer with tracking number. Returns that are lost in the mail will NOT be refunded. Pickle Dog Design does NOT accept returns or refunds on custom (personalized) orders. All items marked as "DOLLAR DEAL" and "LAST CHANCE" are final sale and non-refundable. Dollar Deal jewelry does not come with gift boxes. All other jewelry has a gift box option available upon checkout. Most items listed are ready to go (with the exception of custom orders). Pickle Dog Design takes pride in fast shipping and tries to ship within 5 business days after payment has been received. Saturdays and Sundays are not considered business days. Please make sure the address listed on your Etsy account and PayPal account is correct when placing your order. Items will be shipped to this address. We are not responsible for lost or returned packages. Pickle Dog Design ships through the United States Postal Service (USPS). Most items are shipped via First Class Mail which takes between 3–5 business days for delivery. A delivery confirmation number is included for all shipments within the United States. We will contact you once your order has been shipped to provide a tracking number. Buyers should expect to receive their items within 7–10 days from purchase. Custom orders take longer. If you need to receive your order sooner, you can upgrade the shipping method to USPS Priority Mail upon checkout. This shipping method takes 2–3 business days for delivery. Please note that purchasing this upgraded shipping method only speeds up the shipping time for the item(s) to be delivered, not the production time for the item(s) to be made. If you need a rush order, please send us a message BEFORE ordering to check if meeting your delivery deadline is possible. Please note that rush orders will incur an additional fee. Shipping timelines are estimates given through the United States Post Office (USPS). Once orders are shipped and out of our hands, we are NOT responsible for shipping delays. Shipping rates include packaging supplies, shipping costs, and handling. Pickle Dog Design ships through the United States Postal Service (USPS) via First Class International Mail. Please expect 10–30 business days for delivery. We will contact you once your order has been shipped to provide the customs declaration number (or tracking number) which allows you to track your package within the United States only—packages cannot be tracked once they have left the United States due to the difference in postal systems. Please be aware if your country has customs tax charges. Visit your country's customs agency website for more info. It is the buyer's responsibility to pay for any additional charges due to import. If you need to receive your order sooner, please send us a message BEFORE ordering and we can upgrade your shipping method with a revised receipt. Please note that shipping upgrades will incur an additional fee. Shipping timelines are estimates given through the United States Post Office (USPS). Once orders are shipped and out of our hands, we are NOT responsible for shipping delays due to clearance through customs. Shipping rates include packaging supplies, shipping costs, and handling. It does not include any fees that may be charged at customs. Insurance is also not included. Currently, we do not offer international shipping for our home decor items. However, we are happy to ship to you! Please send us a message regarding the item you're interested in and the country you're from—we'll then calculate the international shipping costs for you. Pickle Dog Design does not insure packages, however insurance can be added for an additional amount at buyer’s request. If you have any specific needs concerning the shipment of your order, simply let us know before placing your order and we will try to accommodate you. Please be aware that shipping modifications will incur an additional fee. Please make sure the address listed on your Etsy account and PayPal account is correct when placing your order. Items will be shipped to this address. We are not responsible for lost or returned packages. If this occurs and packages are returned to us, we will either issue a refund for the price of the item minus the original shipping cost or re-ship it to the correct address at the buyer's expense. International customers, please note that unless you upgrade your shipping to Express International Mail, Pickle Dog Design is NOT responsible for lost or stolen packages through your mail system. All Pickle Dog Design items are handmade in a smoke-free environment. Pickle Dog Design loves custom orders, just send us a message! Custom orders do require payment before being made and are usually processed within 7–10 business days after payment has been received. Some orders may take a little more time depending on the order. All custom (personalized) orders are final sale and non-refundable. Is your purchase a gift? Add gift wrapping to your order at checkout to have your items specially wrapped in kraft paper and tied with a green bow and gift tag. What metal is used for our jewelry? Our earring posts and backs are nickel free iron. We include both metal and rubber backs with all our post earrings. Our necklace chains are also nickel free. When you order jewelry, it's handmade just for you! Although every effort is taken to ensure the strongest materials and adhesives are used, our jewelry is not sweatproof or waterproof. We are happy to do wholesale orders! Please contact us for details. Your feedback is greatly appreciated! We would love to hear what you think of your purchase and service you receive. Will you please take a moment to review your recent purchase(s)? We’re all ears! To leave feedback, just go to “You” (in the top right-hand corner of the screen) and click on “Purchases and Reviews”—you’ll then see the item(s) you purchased from Pickle Dog Design and can leave your feedback. Follow us on Instagram and Facebook (@pickledogdesign) and show off your purchase with #ilovepickledogdesign. We love seeing customer photos!